I was attempting to build one of these last year. 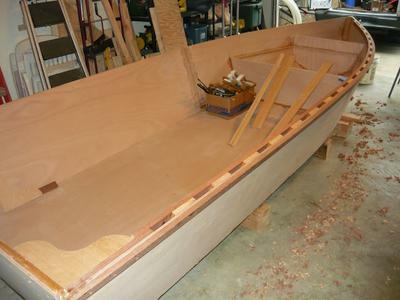 I had the boat stitched up and preliminary thickened epoxy glue in place on the seams, and was going to add the epoxy and glass over the next day. I covered the boat with tarps and went in for the evening. I don't have an indoor place to work, so it is a hit or miss on if I get to work on the boat. That evening my wife became ill.
We spent 3 days at the hospital. We came home and I played nurse for a few more days. Then I went out to look at the boat and the tarps were off the boat, and the whole thing was covered with black mold, it looked like someone had sprayed it with flat black paint.. Eww.. Disappointed, I cut it up..
Well later over the winter my wife had back surgery. I was busy playing nurse again.. So spring came and wife went back to work only to find that she isn't the youthful person that she used to be, those two incidents took the wind out of her sails..
Well she can retire in August; but she was planning to work a few more years..
We were fortunate that the insurance paid a portion of the first incident and 100% of the second. We have a payment plan in place..So retire she did. I spend a lot of time on Craigslist looking, droolling, more than I probably should. Never liked metal boats, or fiberglass for that matter. Even though I worked off and on at a couple boat manufacturers in my youth, I am still partial to wood. 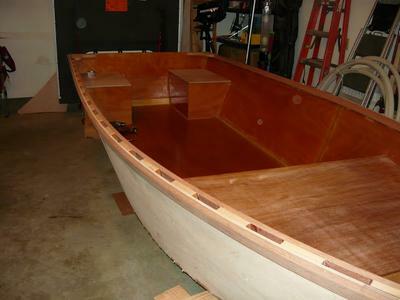 I answered an ad about a wood boat partially finished. The story goes that he had built a couple boats before, he was able to hang those in the rafters of his garage. This one was closer to what he wanted, but was still going to be the steeping stone to the ultimate boat he wanted, a Tolman Skiff. 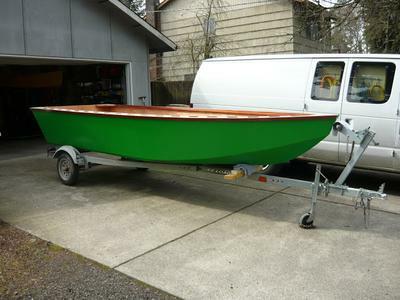 He got the green light to build the boat but first had to make room as the Tolman is going to take every square inch he has. So I drove the 3 hours to his place and saw the boat..
Nice, and workmanship was really good; but the inside was still needing some finish work. I was able to purchase the boat with trailer and brought it home. This has a reinforced floor with a second sheet of plywood as the bottom kind of oil canned in the waves. I will be adding a removable center seat, I like the idea of it being open for crab pots; but yet I can put a seat in to row. I'm contemplating building a center console similar to the small Boston Whaler sport, as I have a 2 stroke 15HP Evinrude Long Shaft with remotes, and only a 6HP Long shaft tiller. Or I could add the extension to my other Evinrude 15 to make it a long shaft..
Boat floats and is stable. Thanks to the builder who started it far enough that I could get the boat useable before it got wet. I'm leaving the inside bright. I had to sell the boat as we moved to a place I can't keep the boat and the cost of moving. The interior was still bare epoxy when I sold it. It probably needs some sort of UV protection over it. I think I own this boat or one exactly like it, I want to do some work on it. However, I don't know what the clear finish is in the interior and want very much to be able to match that as I truly love the look of it. So, if possible maybe you could e-mail me and tell me the secret, I would be very grateful. Sorry to hear about your story Willy Wold. It sounds like you got there after all . Enjoy your boat , and best wishes to you and your wife too!